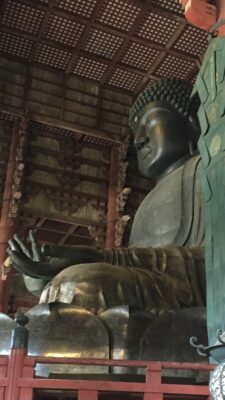 Last fall, I planned a solo three week trip to Japan, a rather ambitious, complicated, itinerary covering quite a bit of geography. Although I’ve traveled alone many times, it has generally been on an organized trip or to see friends. So I had some trepidation about executing all the details by myself. Thus I was delighted when my friends, Debbie and Mike, enthusiastically agreed to join me. As it turns out, this was well-advised. I need supervision. Over the course of just the first few days, I leave my purse on a bench (luckily Mike notices), I obliviously walk away from my suitcase in a train station (Debbie calls my attention to this omission), I nearly knock a conductor off the platform barreling along in a hurry not to miss a train, I mistake a passenger who wants the seat next to me for the conductor collecting tickets, I misplace train tickets and keys to hotel rooms, and lose my gloves! We sure laugh a lot. We visit many places, some of which bring us to tears and others that bring great joy. The Hiroshima Museum is in the first category. The commentary and particularly the photographs depict in vivid detail the extreme horrors of war. On August 6, 1945 at 8:15 am, the United States dropped an atomic bomb on the city of Hiroshima. The bomb exploded 600 meters above ground and in .2 seconds, the fireball reached a temperature of 7,000 degrees Celsius. Temperatures near the hypocenter reached 4,000 degrees. People as far away as 3.5 km received severe burns. 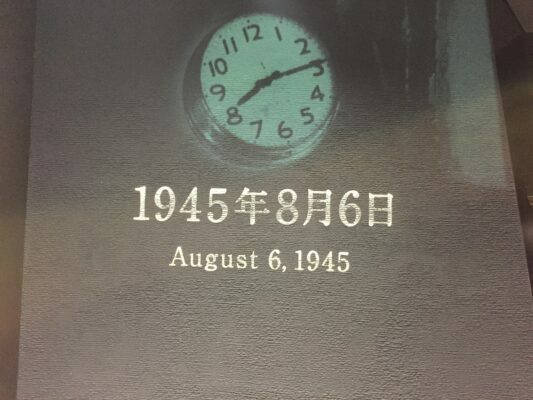 Those closest to the hypocenter had all layers of skin burned off and died immediately or within a few days. The pressure of the blast hurled people and objects, crushing or trapping them under crumbling buildings and other structures. Radiation penetrated cells and tissues causing instant and residual sickness. 145,000 people died. Hiroshima lay in ruins. This was a tragedy of immense proportions for the innocent civilians of Hiroshima. 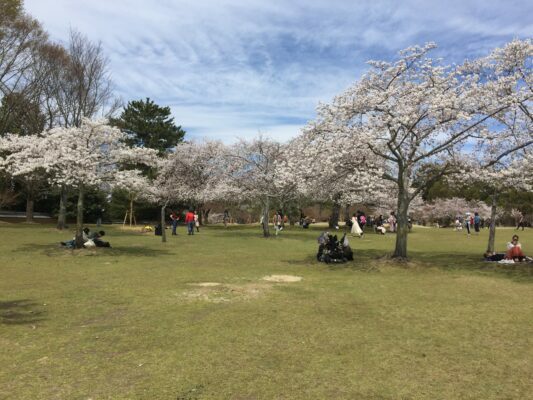 the cherry trees are in full bloom. They are everywhere. The flowers are ethereal. They light up in the sun and brighten the shade. They beckon the eye: a single glorious specimen or a grove of dozens in a park. And there are other beauties: pieris dripping pearly white or pink blooms, their new growth bright red against the older green leaves; azalea, not yet leafed out, lavender petals in various stages of opening; Japanese maples, leaves just beginning to unfurl; every tree or bush pruned in the most aesthetically pleasing way. 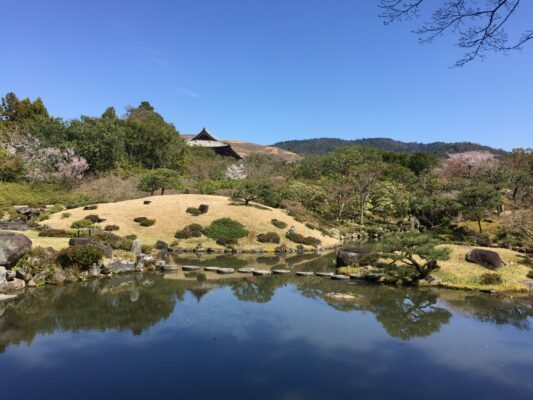 Ornamental bridges cross ponds and streams; waterfalls pour over rocks; steppingstones are strategically placed; wooden buildings, some with delicate lattice, almost all with slate grey tile roofs, adorn hilltops. I remember reading somewhere that the Japanese like to make nature even more beautiful! Next, we make the long train journey to Koyasan, a sacred place in Japan, home for twelve hundred years to monks of the Shingon Buddhist sect. Mt. Koya is 900 meters in elevation and has many temples nestled in the dense forests. Visitors are able to stay in fifty-two of them. 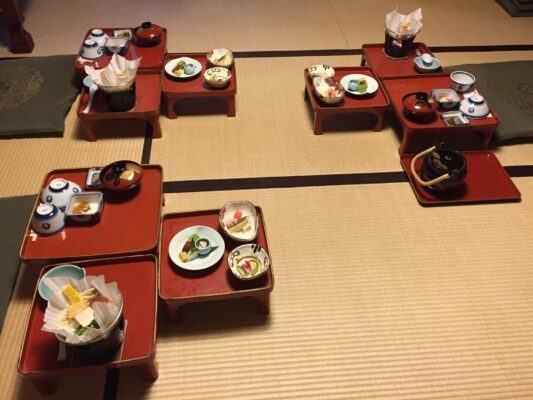 We stay in one for two nights, sleeping on tatami mats and eating the vegetarian meals prepared by the monks and elegantly served in my room on little trays with many small dishes. I attend a 6:00 am meditation where monks chant and pray. We decide to hike the Women Pilgrimage Route, described as two and a half hours and seven km. It’s a sunny, cold morning when we begin at about 9:45 am. The trail is lovely, surrounded by tall Japanese Cedar trees. We have a map and expect to finish at around noon. Although we reach a point where we think the hike will end in thirty-five minutes, we somehow continue for several more hours, encounter no other hikers, and find ourselves on an old, moss-covered, incredibly steep, narrow, road diving deep into a canyon with no apparent way out. We very belatedly conclude we have no idea where we are and decide with utmost annoyance that the only alternative is to retrace our steps for several miles and try to figure where we went so wrong. By the time we do, we have hiked six hours and walked over ten miles! It turns out maybe the three of us need supervision. 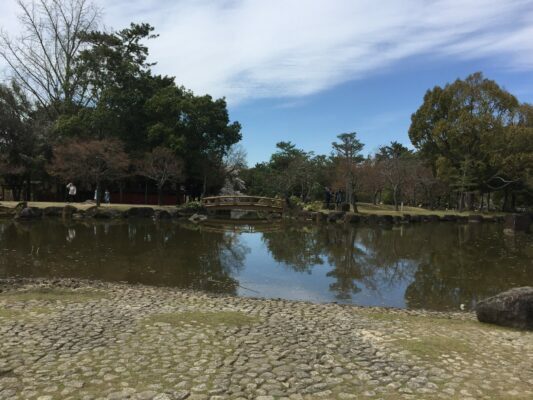 We end the day by taking a guided night tour of Okunoin, Japan’s largest cemetary, where there are more than 200,000 gravestones and memorial pagodas, located among centuries-old giant cedar trees, a truly spectacular setting. 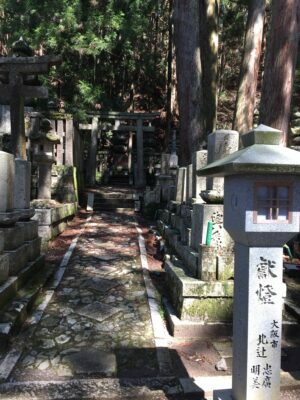 Anyone can be buried there, so long as they can afford to pay two or three million yen for a gravesite! The Japanese people we encounter are kind, gracious, and patient. They readily offer assistance to three often confused travelers. They value order, respect, and beauty. It is a pleasure to experience. 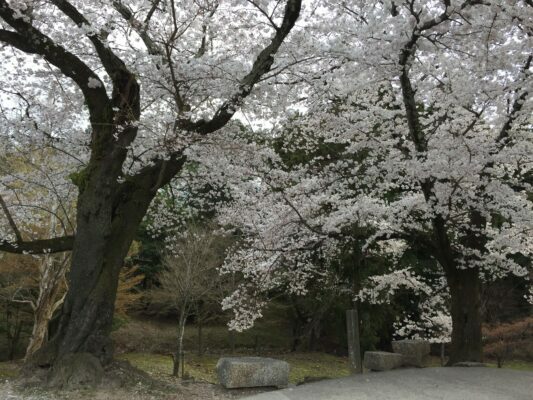 Wow, you caught the cherry blossoms in perfect bloom. Your pictures reminded me of my trip many years ago to Japan. Such a different, but wonderful, culture. Adele, your trip sounds lovely! What a treat it is to read and visualize each of your wonderful journeys. Your words are poetic and your pictures just add to the pleasure. This one is so much a part of our heritage and must be both inspiring and horrific. You continue to amaze me!